Tablets section on Export Portal offers a wide range of tablets. Sell tablets on our site, find customers all over the world and expand your business! Buy tablets online here, get the best deals and options! Tablet is a mobile computer with a touchscreen display, circuitry, and battery in a single device. Tablets come equipped with sensors, including cameras, a microphone, and an accelerometer, and the touchscreen display uses the recognition of finger or stylus gestures replacing the usage of the mouse and keyboard. They usually feature on-screen, pop-up virtual keyboards for typing. Tablets may have physical buttons for basic features such as speaker volume and power, and ports for network communications and battery charging. 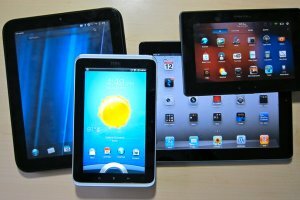 Tablets are typically larger than smartphones or personal digital assistants with screens 7 inches (18 cm) or larger, measured diagonally. Today's tablets use capacitive touchscreens with multi-touch, unlike earlier stylus-driven resistive touchscreen devices. There exist also different types of tablets: slate tablets, mini tablets, phablets, booklets, convertible tablets, hybrid tablets, 2-in-1 tablets, gaming tablets. Tablets come with different operating systems: Android tablets, iOS tablets, Modbook, Windows tablets, Firefox OS tablets, Linux tablets. Most popular brands are Apple tablets, Samsung tablets, Asus tablets. Shop for tablets online, choose the one that is best for you. Trade on Export Portal, get the best for your business selling tablets online on our site. Connect to sellers from all parts of the world buying most popular tablets brands on Export Portal!